The Feast Day of St Josephine Bakhita – the patron saint of victims of modern slavery and human trafficking is celebrated on 8th February. On this day Catholics are encouraged to pray for all those affected by the crimes of modern slavery and human trafficking, and the people that volunteer and work to eradicate this crime. 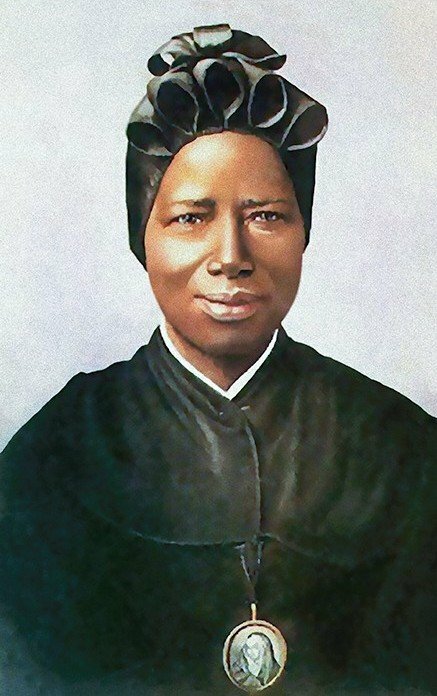 St Josephine Bakhita, also known as ‘Mother Moretta’ was kidnapped at the age of nine and sold into slavery. Such was the trauma experienced that she forgot her birth name and her kidnappers gave her the name Bakhita meaning ‘fortunate’. Flogging and maltreatment were part of her daily life. She experienced the moral and physical humiliations associated with slavery. It was only in 1882 that her suffering was alleviated after she was bought for the Italian Consul. This event was to transform her life. In this family and, subsequently in a second Italian home, she received from her masters, kindness, respect, peace and joy. A change in her owner’s circumstances meant that she was entrusted to the Canossian Sisters and her next fifty years were spent witnessing God’s love through cooking, sewing, embroidery and attending to the door. She was a source of encouragement and her constant smile won people’s hearts, as did her humility and simplicity. As she grew older she experienced long, painful years of sickness, but she continued to persevere in hope, constantly choosing the good. During her last days she relived the painful days of her slavery and more than once begged: ‘Please, loosen the chains… they are heavy!’. Surrounded by the sisters, she died on 8 February 1947. February 8 has been designated as a day of prayer, reflection and action to end the injustice of human trafficking. On this day a Mass at St Mary’s Cathedral is held to commemorate the Feast Day of St Bakhita.